I’m always a bit frustrated when I see articles like this one from Cathy Lynn Grossman on the Religion News Service, entitled They never tell the whole story. It’s accurate that many churches have traded the traditional choir for a more contemporary ensemble in their services. I don’t think we can argue with that. 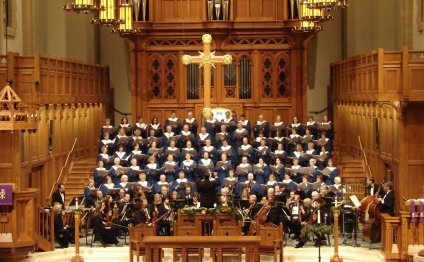 But what the article doesn’t say is that there are many churches in which the choral art still grows and flourishes. Beyond that, there is no real discussion of what is being forfeited in this installment of Christian culture’s relentless pursuit of what is trendy. There is much in the article that could be addressed, but instead of offering a blow-by-blow rebuttal, I’d rather take a minute to discuss the unique presence good choral music brings into corporate worship. 1. Choirs support good congregational singing. A solo leader singing into a microphone sends a message to the congregation that its role is similar to that of an audience at a rock concert: “Sing along if you please, as obnoxiously as you please, as sloppily as you please.” If you’ve been to church recently, especially in churches that use only commercial Christian music, you may have noticed that most often, congregants choose not to sing at all. The amplification puts up a barrier to singing, rather than establishing a musical current to help the congregation. On the other hand, a choir demonstrates that the voice of the congregation is primary, not secondary. It encourages them to join in by lifting their voices, without overpowering them with a wall of amplification. 2. Their visual presence is an encouragement to the congregation. I can’t tell you how many times I’ve heard a worship leader admonish congregants “to get alone with God, ” and pretend that there is no one else around. There is a time and place for that, but worship gatherings are neither the time nor the place. We are there to be together, to worship God with each other, to be community. When there are only a few leading, it’s easy to forget this, to feel alone. But when we look up and see a mini-congregation of faces looking back at us, we’re reminded that we’re not alone, that we’re there to be part of a very special communion. And, of course, it’s all in practice for when we join that great heavenly praise team chorus around the very throne of our Creator/Redeemer God, the Object of our worship. Christ Church Choir - "Do You Hear What I Hear?"